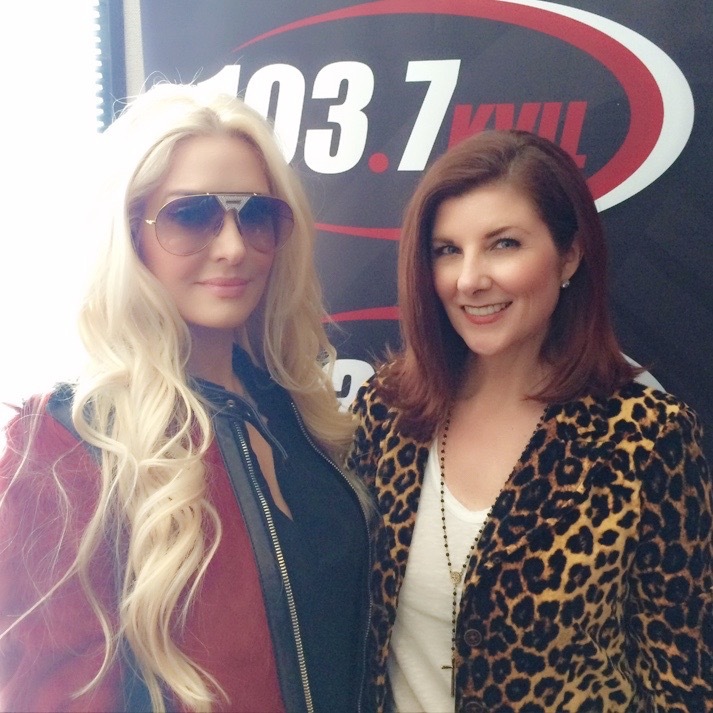 This past Friday, I found myself in the KVIL 103.7 FM studios to meet Real Housewives of Beverly Hills star, Erika Girardi a.k.a Erika Jayne. For those of you who are not RHOBH watchers, let me fill you in: Erika is the newest cast member of Bravo's Real Housewives of Beverly Hills, Season 6. Erika is an American singer-songwriter, dancer and television personality. Since 2007, she's had a total of eight number one singles on the U.S. Billboard Hot Dance Club Play chart. She's also married to a billionaire attorney (more on that later in the article). Described as being sassy, fun and provocative when performing on stage, Erika has said that she originally created the alter ego "Erika Jayne" to keep her stage persona separate from who she really is. She describes Erika Jayne as being "a fantasy character", despite being "a real part of me, but not 24 hours a day." She's become a breakout star on RHOBH this season for her cool demeanor and "I don't give a f*$k" attitude. Erika is married to Thomas (Tom) Girardi, a founding partner of Girardi & Keese in downtown Los Angeles. In 1970, Girardi became the first attorney in the state of California to win a $1 million-plus award for a medical malpractice case. Girardi has handled major cases against the former Lockheed Corp (now the Lockheed Martin Corp.), Pacific Gas & Electric Co, Los Angeles County Metropolitan Transportation Authority, and Hollywood's seven major movie studios. In one of his better known cases against Pacific Gas & Electric, the utility company agreed to pay $333 million to 650 residents of the desert community of Hinkley, California. The residents blamed incidents of cancer and other diseases on contaminated water leaked from a gas pumping station. This case was the inspiration for the film Erin Brockovich starring Julia Roberts.They live in a 5-acre 1920s Pasadena mansion co-architected by Myron Hunt. With the help of interior decorator Joan Behnke, the estate has a feeling of old Hollywood glamour, making it seem like “Jean Harlow could descend down the staircase at any moment.” The bottom line, is that they are LOADED and it's super fun to live vicariously through Erika via the show. You can tune in to watch RHOBH on Bravo every Tuesday, 8PM CST.